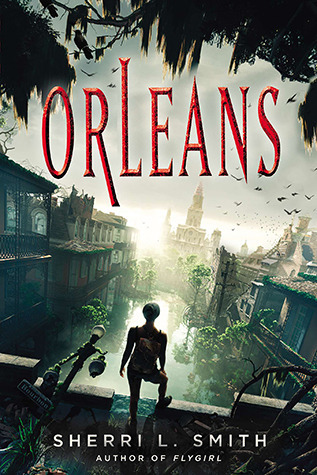 Orleans by Sherri Smith. Penguin, 2013. Currently available. Face Value: I adore this cover. With fantasy and futuristic book covers, I find that the cover illustrators/designers can be reluctant to go into much detail. It’s almost as if they’re afraid to give too many details of the fictional world lest they betray the reader’s vision. The cover of Orleans does not hold back. We see the ruins of New Orleans, juxtaposed with the green growth of plants rising above the water. And Fen is looking over it all. This artwork captures the devastation and new life that is rising from the spectacular fictional world Smith has crafted. Does it break the slate? Yes. Oh, so much yes. Fen is wise beyond her years. She has been through some terrible, terrible things – but she has always been clever enough to survive and find a way out. What I find so fascinating about Fen is that she is so much a character based in a place. Fen is the Delta. Based on the survival skills and ingenuity she shows throughout the book, I have no doubt that she could escape and fine a new life on the other side of the wall. Yet, that’s never something she considers. She was born here and she will die here. The Delta is in her blood…literally. Review: Rejoice, my reading friends, for dystopias are not dead. Though they may be flooding the market, there are still futuristic novels that stand out. Orleans is one of those shining gems. Sherri Smith has built a futuristic world with clarity. The Delta of the future has seceded from the continental United States as a measure of quarantine. After a series of increasingly devastating hurricanes, the population is wiped out and infrastructure ruined. The few who survived succumb to a horrific blood disease called Delta fever. It is untreatable, and it ravages those who are left. The residents of the Delta have restructured society in order to survive. They organize themselves into tribes based on blood type, because it reduces transition of the Delta Fever. Racism based on skin color is no longer a factor in the Delta because their isolation from the outside world has caused an intermingling of races. Now, blood type is the factor upon which your fate is based. It is a sinister twist, and a scary prospect. If humans ever manage to move past racism, will we still find ways to separate ourselves and discriminate? The Delta of Smith’s imagination is a believable setting. Although it’s a terrifying notion, I wouldn’t be shocked if this is where our world is headed. I attribute this to Smith’s smart use of elements that are rooted in real life, such as severe weather and increased political unrest. The world of the Delta functions on motivations that are rooted in the very basest parts of human nature: love, greed, and survival. Fen as a character is simply astounding. She has completely altered her identity and appearance in order to survive. Yes, there is nostalgia for her past life, but no regret. Fen moves forward during moments that would hold a lesser woman back. Circumstances lead her to become the primary character for an infant that she calls Baby Girl. Fen is nurturing, but that does not become her defining characteristic. She is a woman with a baby but she still maintains independence. Rather than compromising her freedom, her status as caregiver fuels her to fight harder and make a better future for Baby Girl. Another fantastic element of this book is Fen’s relationship with Daniel, the other primary character in Orleans. He is a researcher who has slipped into the Delta region to pursue a cure for Delta Fever. He meets Fen by chance, and they forge a partnership. Their relationship is not about romance, and THANK GOODNESS for that. It’s about survival. They’re not sticking together because of mutual attraction. They are working together to blend skills and knowledge to make the best team possible in a crappy situation. The ending of the book completely threw me. Smith makes us trust Fen and her impeccable instincts, and then shocks us with the outcome. I don’t want to say too much here because you should definitely go and get this book for yourself. We have to support authors like Smith who are putting out strong fiction featuring non-romantic male/female relationships and strong, intelligent women. I want to read more fiction like this. This entry was posted in Reviews, Young Adult and tagged Dystopia, hurricanes, New Orleans, severe weather, Survival. Bookmark the permalink.